The 2016 Toyota Sienna has achieved a new standard in style and technology, earning it a ranking of Best Minivan fromEdmunds.com and Parents Magazine. The Sienna comes with a Driver Easy Speak option that uses the microphone that's part ofthe van's voice-command multi-media system. So rather than someone having to shout at passengersin the rear of the van, the vehicle uses the mic to pipe the driver's voice through the audio system's rear speakers. If you're a wheelchair user who has trouble projecting your voice and feel it's hard for others to hear youwhen you're on the road, this could be a huge perk! We've become used to having all forms of entertainment at our fingertips while en route, but the 2016 Siennagoesabove and beyond.Its features include a Dual-View Entertainment Center with Blu-Ray capability, an SD card reader that can play 10 different audio and video formats from two separate sources, and wireless headphones. While Toyota says the new Sienna wants to "make parenting easier," it's far from a "mom van." Still, any mom would appreciate the Brake Assist and Smart Stop Technology, a walk-in aisle, and multiple storage bins throughout the cabin. 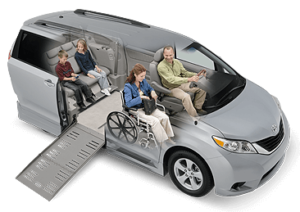 Bottom line, the Toyota Sienna has never looked or performed better for the families it works for day in and day out. No accessible vehicle manufacturer takes greater measures to ensure that Toyota quality and performance are retained after our conversion than BraunAbility. Don't take our word for it alone - learn more about the Sienna's latest accolades at Parents.com and Edmunds.com and then head to your nearest BraunAbility dealer for a first-hand experience!